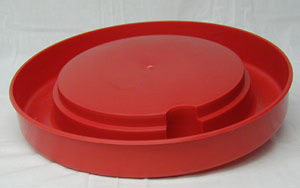 This plastic base will turn your 3 or 5 gallon plastic pail (pail is not included) into a tip-over waterer. Easy to clean, can’t rust, quick filling 2 1/4” wide by 2 3/8” deep trough makes it perect for adult birds. Is this base deep enough for adult ducks?